Cleaning an aquarium is no fun and watering and fertilizing plants is a chore, but when you bring fish and plants together, there's this cool new AquaFarm - Aquaponic Garden and Self-Cleaning Aquarium. 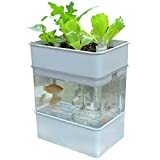 This innovative closed-loop eco-system allows vegetable plants and herbs growing on top to clean the water in the aquarium below, while the fish waste produced in the aquarium below naturally fertilizes the plants above. Even better, it provides organic beans, basil, thyme, baby greens, oregano, mint, parsley, spinach, and more for you to enjoy while also getting the entertainment bonus of watching a little Betta fish swim around. Very cool.